Microdermabrasion is the controlled, physical exfoliation of the top layers of the skin. It removes the old, damaged and dull skin layers to reveal fresher, more radiant, younger looking skin. By removing skin debris, it corrects or minimizes imperfections, blemishes and age damage. Microdermabrasion can be combined with multivitamin infusions, enhancing the penetration of active ingredients in skin care products by up to 4000%. This further improves general skin texture and tone and can be tailored to suit your skin type and condition. Microdermabrasion is a painless, non-invasive treatment that takes under an hour to go from dull, lifeless skin to radiant and beaming skin. It utilises a diamond tip wand with a suction that is applied in a brushstroke manner over the required treatment area. 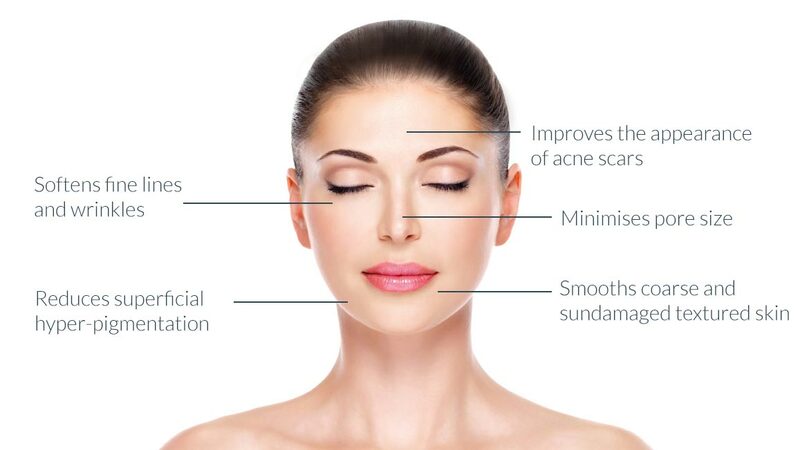 Microdermabrasion is not a harsh or deep treatment requiring days to heal. Slight flaking and mild redness may occur, which in most cases will subside within 24 hours. Make up can be applied immediately following the procedure making it a suitable lunchtime procedure. Depending on your skin type, treatment plans are tailored to suit your needs and your desired results. Typically, one treatment per fortnight of 6 treatments is required for optimal results. As part of a maintenance program, one treatment per 2-3 months is recommended.